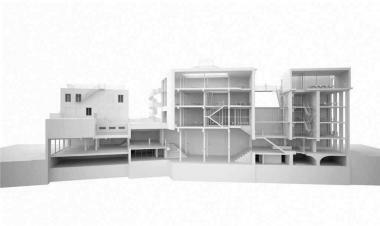 2012-07-04 - The architecture competition launched by the City of Brussels with a view to renovating an industrial building to provide premises for MAD Brussels (Mode & Design Brussels) is now closed, and the winning team has been chosen. It was the architects’ partnership ‘Vers plus de bien-être’ and the designers at ‘ROTOR’ that caught the panel’s notice and won the competition with a strong, clear concept. Rather than starting from scratch, the team’s plan keeps much of the existing building. The interior décor will use a wide variety of materials all of which are close to white. ‘The plan enables the building to be kept virtually as it is! At the same time, it offers a fine showcase for mode and design in Brussels, which will soon be based at the heart of their local area! This strategic position should give these sectors the high profile we are aiming forand help define the district’s identity,’ stated the City of Brussels Alderman for Tourism, who is also the President of MAD. The non-profit organisation ASBL MAD Brussels was created by the Brussels-Capital Region and the City of Brussels in 2010 to promote designers and stylists from Brussels, and to stimulate the development of this sector and raise its national and international profile. The Region and Europe have invested €3.5 million via the ERDF funds, an amount matched by the City of Brussels for the acquisition in 2010 and renovation of the 3,000 m² building located at Place du Nouveau Marché aux Grains, in the heart of the Dansaert district. The competition, the purpose of which was to come up with a vision for the new use of the premises as a centre for fashion and design, was launched in October 2011. 37 firms submitted entries. Key selection criteria set by the panel of judges included the project’s architectural and aesthetic quality, the approach to the notion of design, techniques employed, sustainability (plans were required to meet the low energy standard as a minimum) and the treatment of the architectural heritage. Until the building’s renovation is complete, MAD Brussels has set up its offices at the Centre Dansaert and is developing an annual programme. The work will start at the end of 2013 and should take at least two years.